Economic activity moderated but remained positive as Texas enters the ninth year of the business-cycle expansion. Payroll employment grew at a steady pace despite historically low unemployment. Headline wage numbers, however, remained sluggish despite labor-market tightness and decreased inflationary pressure. Energy prices stabilized after a recent bout of volatility, and crude oil production and exports held firm. Texas exports continued to flourish as products shifted from China to other economic partners, but the ongoing dispute between the world's two largest economies could contribute to waning global activity. Political tension and gridlock in Washington added to the current state of uncertainty. The Dallas Fed's Texas Business-Cycle Index slowed to 3.8 growth on a seasonally adjusted annualized rate (SAAR), the slowest in over a year but continued to press forward. At the metropolitan level, much of the deceleration occurred in Fort Worth as employment weakened and pulled the business-cycle index below 1.1 percent SAAR. 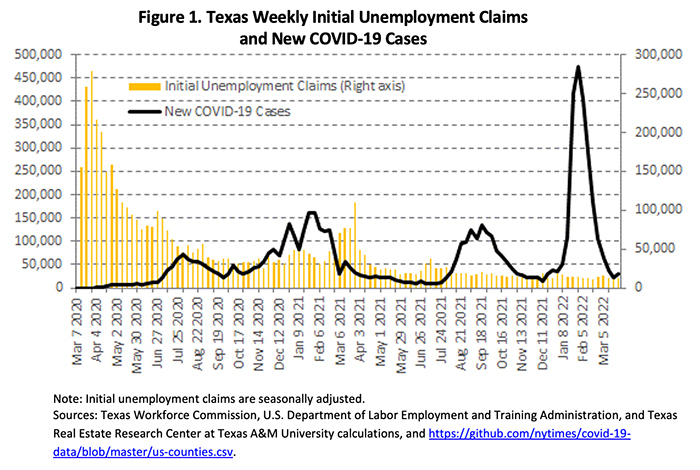 The index, however, accelerated to 4.6 and 5.6 percent, respectively, in Austin and Dallas. Houston's index picked up from 2.4 to 2.9 percent, the same growth rate as in San Antonio. 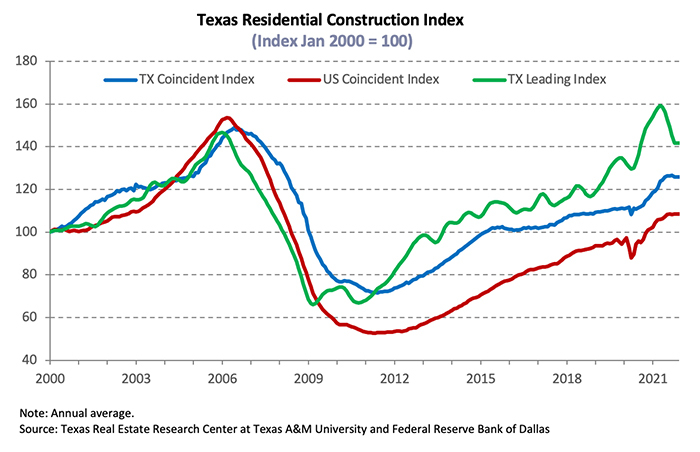 The Texas Leading Economic Index (a measure of future directional changes in the business cycle) inched forward amid labor-market strength and stable crude oil production. Some signs of weakness in national economic data, however, suggest slower growth over the next year. Texans remained cautiously optimistic after the sharp drop in oil prices last fall. 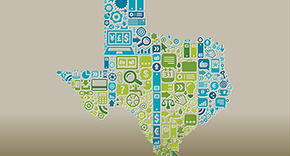 The Texas Consumer Confidence Index inched forward but remained below the October 2018 peak. Softer economic data, particularly in February's U.S. employment report, decreased inflation expectations and weighed on interest rates. The ten-year U.S. Treasury bond yield fell to an annual low of less than 2.7 percent, while the Federal Home Loan Mortgage Corporation's 30-year fixed-rate dropped to 4.4 percent. Texans capitalized on lower rates, pushing mortgage applications for home purchases up 11.2 percent in the first two months of 2019. Refinance mortgage applications, which are more sensitive to interest rate fluctuations, increased 20.2 percent year to date. The average West Texas intermediate crude oil spot price rebounded above $54 per barrel after four consecutive monthly declines. OPEC production cuts and oilfield disruptions in Nigeria and Libya supported higher prices despite soft economic data at the national level. Texas production balanced around a record-high 4.8 million barrels per day in January while the active rig count inched down to 5122. Additional pipeline capacity relieved bottlenecks in West Texas, but anticipated supply growth could quickly diminish the impact. On the natural gas front, the Henry Hub spot price ticked above $3 per million British thermal units after a sharp drop in January. A warmer-than-usual winter, however, maintained downward pricing pressure. Texas added 17,700 nonfarm jobs in February, in comparison to 20,000 net jobs created nationally. Employment growth held around 1.8 percent on a SAAR, persisting above the Dallas Fed's 1.5 percent 2019 growth projection but notably lower than last year's levels. Skilled-labor shortages hindered additional hiring throughout the state. The unemployment rate held below 3.9 percent despite labor force participation ticking upward for the first time since September, reaching 64 percent. Initial unemployment insurance claims fell for the second straight month, corroborating labor-market tightness. 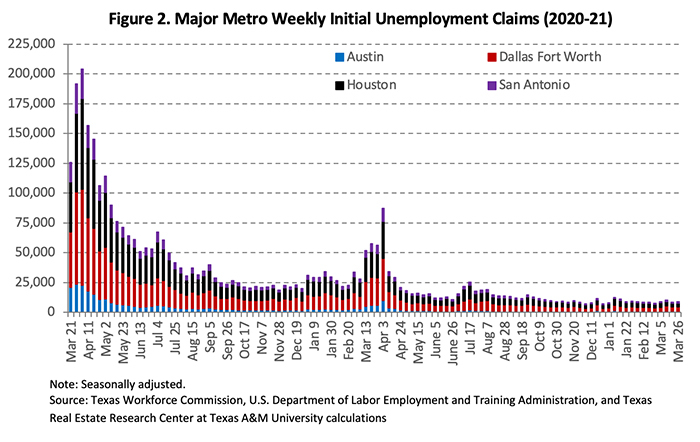 The major metros maintained even less slack with unemployment rates falling across the board. Some of the decline, however, may be payback after the federal government shutdown inflated unemployment reporting in January. 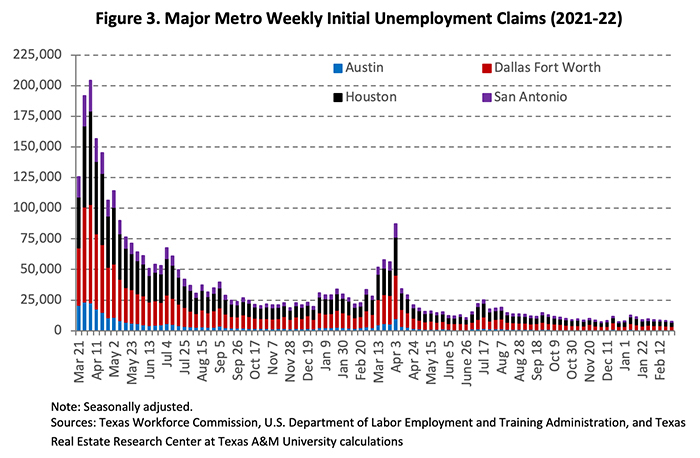 Austin maintained the lowest unemployment rate at 3.0 percent, followed by San Antonio at 3.4 percent. North Texas was not far behind with 3.6 and 3.7 percent unemployment in Dallas and Fort Worth, respectively. Houston unemployment held above the state level at 4.2 percent but could inch downward if oil prices continue to stabilize. Despite prolonged labor shortages, Texas' real income per capita rose just 1.8 percent in 2018, ranking 27th nationally in terms of annual growth. The increase, however, was notably better than each of the past three years. The state's strongest contributors to income growth were oil and gas extraction, construction, and professional/scientific/technical services industries. Contemporaneous data suggest a continuation of tepid growth in the first two months of 2019. Texas' real private hourly earnings remained tame at 1.3 percent growth year over year (YOY). Dallas wages increased 5.1 percent YOY, reaching $30.15 per hour in nominal terms. Fort Worth ($26.56) and Houston ($27.96) maintained modest growth at 1.8 and 0.9 percent YOY, respectively. Austin hourly earnings edged below $29.25, contracting 1.1 percent YOY. On the other hand, growth accelerated to 3.1 percent in San Antonio, elevating nominal wages to a record high $24.22 per hour. Softer inflationary pressure improved purchasing power across the state. Dallas led the state in hiring with 11,600 newly created jobs, the largest increase since 2016. Most of the growth occurred in the professional/business services, leisure/hospitality, and trade/transportation/utilities industries. Houston added a record number of manufacturing jobs at 4,825, lifting the total monthly employment increase to 9,100. Growth in Austin's public sector as well as professional/business services pushed employment growth into positive territory after faltering in January. In San Antonio, construction employment gains reached a record of high more than 1,160 as single-family housing construction accelerated over the past quarter. Fort Worth was the exception where broad-based industry declines contracted employment figures for the second consecutive month. The largest losses occurred in construction and leisure/hospitality jobs. The metro recovered all of January's lost transportation jobs, which may have been negatively affected by the government shutdown, but durable-goods manufacturing shed an additional 390 jobs. Texas' goods-producing sector as a whole added just 800 jobs, but data revisions revealed 2,800 lost jobs in January instead of the 5,100 originally reported. Manufacturing employment offset last month's decline with 1,400 new jobs, all of which occurred in the nondurable-goods subsector. Recent weakness, however, held hourly manufacturing earnings slightly negative YOY after accounting for inflation. Real hourly industry earnings decreased YOY in all of the major metros. Fort Worth was the exception where earnings-per-hour jumped 5.1 percent YOY in real terms after a steady four-year slide. These fluctuations, however, may be sensitive to short-term changes in how employees contracted by the federal government were measured during the temporary shutdown. In the Dallas Fed's Manufacturing Outlook Survey, more than a fifth of respondents expanded payroll employment, and 30.1 percent paid higher wages and benefits. Production and capacity use slowed as manufacturers adjusted to waning global growth. U.S.-China trade tensions remained the primary concern across multiple subsectors. Hiring was mixed in the remaining goods-producing sectors. Energy employment contracted for the first time since November 2016, while the construction industry recovered 500 of the 2,800 jobs shed in January. Real hourly construction earnings dipped negative YOY after substantial growth in the first half of 2018. Total construction values, however, ticked up as the residential sector stabilized following a five-month slide. Apartment construction picked up in Austin, DFW, and Houston amid solid population growth and shifting preferences toward higher-density housing. In the nonresidential sector, declines in office/bank building offset an acceleration in warehouse investment. 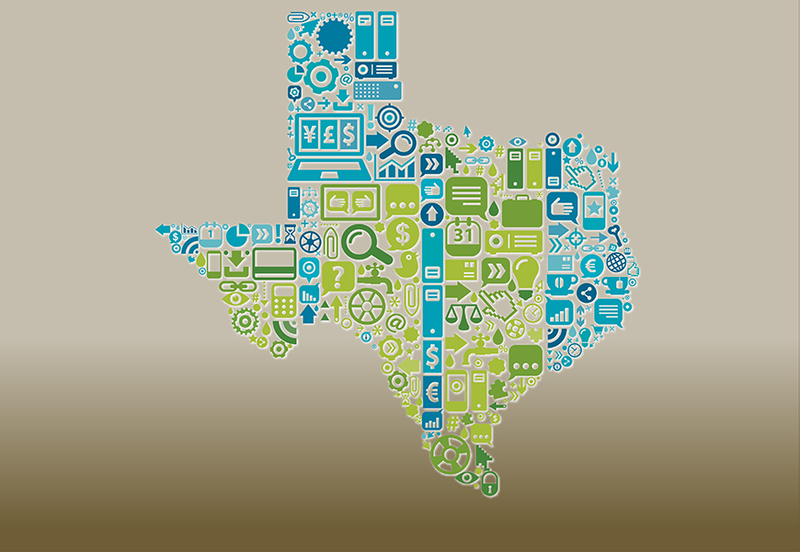 Texas' service-providing sector created 16,900 positions, maintaining steady growth after stalling in 4Q2018. Leisure and hospitality rebounded with 5,500 new jobs, accounting for 31 percent of the aggregate monthly increase. Accommodation/food services and finance/insurance employment added 4,300 and 4,100 jobs, respectively. On the other hand, the transportation/warehousing/ utilities subsector continued to struggle, shedding 4,200 jobs over the past three months. The Dallas Fed's Service Sector Outlook Survey corroborated industry strength with nearly a third of respondents noting higher revenues, and the employment indices accelerated. The survey, however, reported increased pricing pressure in both wages and inputs, contrasting hard inflation data. Lower energy prices slowed the U.S. Consumer Price Index (CPI) to 1.5 percent YOY, its weakest increase since 2016. Core inflation held slightly above the 2 percent benchmark but trended downward, particularly due to lower price tags on new vehicles and prescription drugs. A sharp drop in transportation costs (e.g., airline fares and auto insurance) pulled the Houston CPI below 1 percent YOY growth. Moderations in home-price appreciation also relaxed inflationary pressures. Despite the ongoing U.S.-China trade dispute, Texas' real commodity exports3 grew 4.5 percent in January, accounting for 20 percent of the national total. Manufacturing exports, specifically, increased 5.7 percent in real terms, driven by computer/electronic products and electrical equipment/appliances and components. Crude oil exports reached record highs amid surging shipments to South Korea, Taiwan, and Canada. Petroleum exports, however, fell for the third consecutive month. Fluctuations in trade relations altered Texas' national export distribution. Mexico remained the primary trade partner and received a third of Texas' outgoing shipments, followed by Canada at 8.2 percent. The Netherlands ranked third at 4.5 percent, followed by South Korea and Japan. China's share dropped to 2.6 percent, the lowest since 2003 after it had been recently admitted to the World Trade Organization. 2 The release of Texas crude oil production typically lags the Outlook for the Texas Economy by one month.